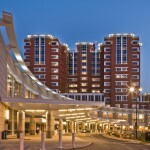 The University of Kentucky hospital system recently completed construction of a new 1.2 million square foot patient care facility. With a 68,265 square foot patient floor and a 35,795 square foot emergency room, Turner Construction and the University of Kentucky wanted to contract with a company that could provide the new facility with a state-of-the-art solution for overhead medical equipment support structures. Healthcare Technology Corporation was selected as the supplier for this equipment and fitted the new facility with 127 mounting systems including equipment boom, anesthesia boom, surgical light and exam light Accu-Mount Support Systems as well as 72 Tandem ICU Boom Accu-Mount Support Systems that provide highly flexible configurations. Installation of the Accu-Mount Support Systems was performed by Turner Construction trades utilizing Healthcare Technology Corporation’s installation guidelines and an on-site assembly demonstration. As is the case in all Accu-Mount Support Systems installations, on-site fabrication and welding were eliminated which greatly reduced the installation time compared to typical custom-designed and site-fabricated support structures.